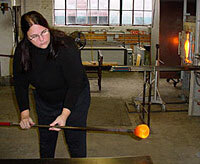 A native of Cleveland, Ohio, Linda Zmina works in her hot glass studio which she shares with her husband, Earl O. James. The facility is in an industrial area overlooking the railroad tracks where the activity of the trains has become a familiar and comforting sound. 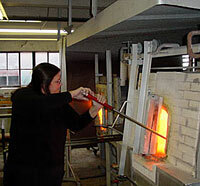 They began the studio in 1989 with a furnace, glory hole and an annealer. The studio has since been expanded to include several annealers for casting, a cold shop, metal fabricating area and a woodworking area. 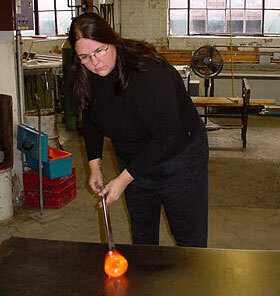 From this Linda and Earl can produce blown glass forms as well as sculpture. The studio’s vista views of the downtown skyline and urban renewal have infused into Linda’s sculptural forms which are based on architectural forms. Conversely, her blown glass vessel forms have decorations inspired by organic rhythms and nature. One such series is called the Birth of Stars which draws upon the ethereal images of nebulae from outer space. These blown glass pieces are produced by layering transparent glass shards as part of the glassblowing process. As accompaniment to the Birth of Stars series, there are blown glass vases and bowls which are about the pure and simple beauty of glass as material and its expression of form and color. The glass vases developed out of a love for blowing glass and painting. Rather than using paint, Linda produces a pallet of blown glass chards which are torched on collage style and cased within the layers of glass. Linda is a graduate of St. John College and the Cleveland Institute of Art. In addition to working in the studio, she also teaches art in the Cleveland Municipal School District.